High Fibre food for weight loss, Indian fibre weight loss recipes. 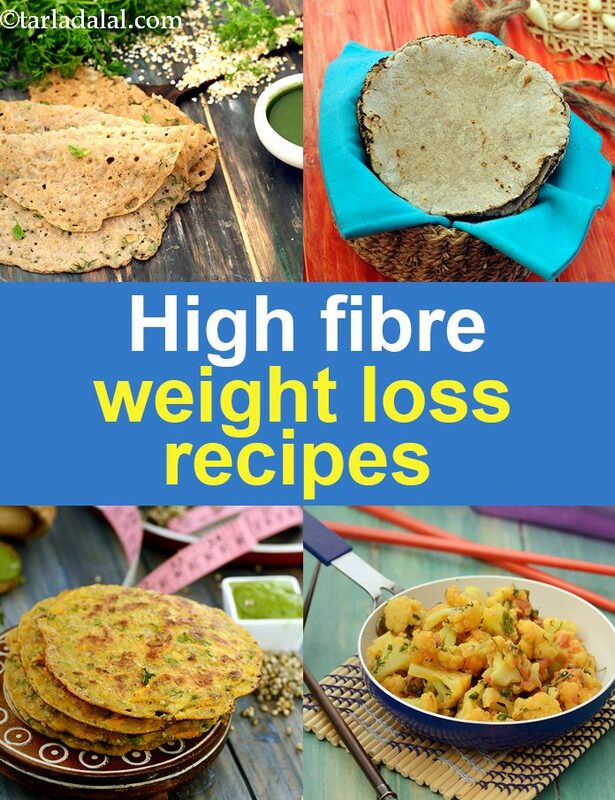 High Fibre foods for weight loss, Fibre Rich Indian weight loss recipes. High Fibre foods for weight loss, Fibre Rich Indian weight loss recipes. Believe it or not, it is possible to lose weight rapidly by eating delicious, fiber rich foods that will keep you satisfied all day long. It not only keeps us full for long hours but indirectly also helps to zap hunger. It slows down the process of digestion, keeps you satiated and thus aid in weight loss. You need to turn to whole grains, cereals, sprouts, fruits and vegetables (with peel on), seeds like flax seeds to achieve your goal of losing that excess body fat. Amongst cereals, whole bajra, oats and jowar are a few good options to be included in the diet. Fruits and veggies like apple, broccoli, mushroom, fresh figs, grapefruit, cluster beans etc. top the weight loss diet sheet. Include them for breakfast, main meals and snacks daily over a long period of time to benefit for them. Can those looking to loose weight have dosas? Not this traditional dosa recipe as foods like rice are high in Glycemic index are not suitable for weight loss, heart patients, diabetics as they affect the blood sugar control levels. Have the fibre rich oats dosa which is gluten free and a good source of protein. Even better is add peas to the oats for a filling oats mutter dosa fiber rich recipe. Make intelligent choices in your Indian breads. Opt for fiber rich bajra roti, jowar roti and whole wheat roti and say no to usage of plain flour in your rotis or parathas. Say no to aloo gobi ke parathe as it has lots of potatoes which are high in simple carbohydrates and have 244 calories for aloo gobi parathe. Say yes to thepla as its made with whole wheat flour and curds. Finally we have a healthy Whole wheat kulcha recipe for you without the usage of plain flour. Say no to rice as that is not good for weight loss as it has ZERO fiber. Instead opt for Bajra, Whole Moong and Green Pea Khichdi or fada ni khichdi with a bowl of low fat curds. To know how to cook using these ingredients, scroll down through the recipes in this section. Cucumber and Mixed Sprouts Subzi, Flax seeds crackers with Beetroot Dip, Grapefruit and Green Apple Salad and Mushroom Soup are a few recipes which you can try hand in your own kitchen to be assured of the ingredients and nutrients that make up your weight loss meal. Enjoy our High Fibre foods for weight loss, Fibre Rich Indian weight loss recipes and high fiber articles below.